A new website for us, a new smartwatch for you! Here’s everything you need to know. And there’s also something amazing waiting for you. We’re proud to show you what we’ve been working on in the last weeks. 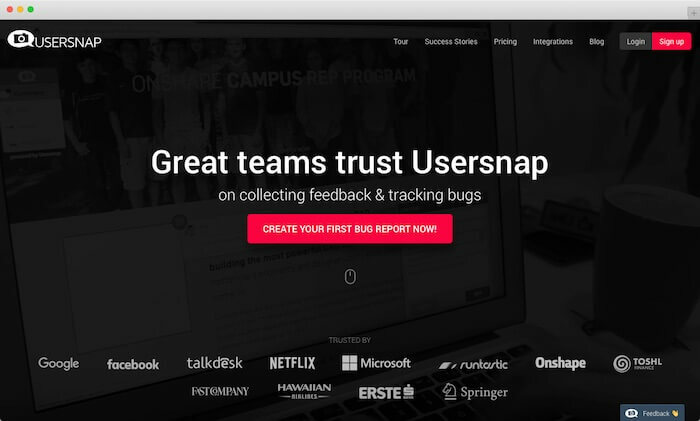 With a all new technological basis, using a static site generator and a complete new web development workflow for deploying our website, we are excited to show you our all new website usersnap.com. If you have some feedback for us, make use of the integrated feedback button in the bottom right corner and send us some comments and feedback on what you think about the new website. Spread the #loveusersnap from now until March 11th to be entered to win a smartwatch (Apple or Android – your choice). Tell us on Twitter using the hashtag #loveusersnap to be entered to win. Don’t use social media? You can also enter by commenting on this post. Click here to tweet now (you can tweet as many reasons as you can think of and participate as often as you like). Just tweet your answer to the question “Why do you love Usersnap?” or just complete this sentence “I #loveusersnap, because …” and share it on Twitter! Don’t have Twitter? You can also leave a comment in this blog post below to be entered. We’re stoked by all your #loveusersnap tweets. Thank you all for your participation. It was incredible to see how people are using Usersnap and how it helps them to collaborate on web projects. Have fun with the goodie bag, Jeremie!